Tiny Practice Amp with a Mighty Roar. When I purchased my Ibanez TMB-310 Bass Guitar from Sweetwater, I knew I'd need a good practice amp to go along with it. It had to be small enough to fit the tight confines of my bedroom project studio, sound good and be affordable ( -preferably under $150.00 ). A tall order to be sure! After doing lots of research it became apparent ( -from all of the favorable reviews I was reading on various music dealer's websites and on the web ), that Peavey's Vypyr "VIP-1" would be among the top contenders for my consideration. So, I went ahead and ordered one along with my Ibanez TMB-310. And I'm really glad I did. The VIP-1 lived up to all the reviews I'd been reading and then some. If you're looking for a great little practice amp ( -that you can use with both bass and guitar ) this one gets my "thumbs up". "If you're looking for a great little practice-amp that you can use with both bass and guitar, this one gets my thumbs up!" -Tomm Buzzetta, Editor CTN . Rated at 20-watts, capable of handling both bass and guitar signals and having a nice selection of ( 36 ) onboard amp models and ( 20 ) effects ( -complete with control parameters ), the VIP-1 gives you astonishing "bang-for-your-buck"! And when it comes to power, this little brute has it by the bucket load. It's 20-watts actually sounds more like 50-60 watts! I can say is that I was thoroughly impressed with the fat, "rounded" tone I got from this little practice amp. I kept telling myself "an eight-inch speaker shouldn't be capable of putting out this much bass". None-the-less the Vypyr VIP-1 did! Sure, it wasn't up to the levels you'd get from a 1 x 15" or 1 x 12"
cab but it DID match what I've heard coming from some 1 x 10" 's. The Vypyr VIP-1 uses a 32-bit floating-point SHARC DSP processor for effects and amp modeling. And overall, it does a good job. While I thought a few of the effects could've been better I'm not going to complain too loudly. Remember, you're getting an amp that can handle both bass and guitar signals as well as transform your axe into several different instrument "models"( -all for under $150.00 ). as little as $129.99 ( -from Sweetwater, for example ). Imagine how much all of that stuff would cost you separately! And what a hassle it would be to lug around when gigging! So, again, you'll get no complaints from me. This little monster absolutely ROCKS! "Imagine how much all of this stuff would cost you separately! And what a hassle it would be to lug around when gigging!" ( -RIGHT ) The graphic to the right illustrates the Peavey VYPYR VIP-1's "instrument modeling" feature. If there was ever a "tone chameleon" of an amp, the Vypyr VIP-1 is it! *NOTE: The other models in the Vypyr Series also have this "instrument modeling" capability as well. comp/ chorus, flanger, octaver, tremolo, rotary speaker, reverb, delay ( -with tap tempo ). 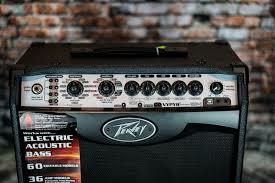 Peavey's Vypyr VIP-1 is a terrific little practice amp! 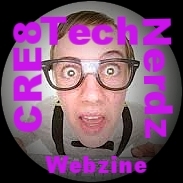 It offers you a ton of cool features, sounds great, is loud as hell ( -for 20 watts! ) and can be had for a song. A stone cold "steal of a deal". Grab one of these little monsters before they stop making them. You won't be sorry! A Peavey "All-Instrument" Practice Amp? As nifty as Peavey's "Vypyr Series" is, how cool would it be if Peavey came out with an "ALL INSTRUMENT"
mini ( wide-dispersion ) horn to handle the high frequency requirements of synths and keyboards. WHY should synthesists and keyboardists be left out of all the fun? As a synth/ keyboard player, I'd love to own such an "ALL INSTRUMENT" practice amp. And I'm sure there are plenty of other "multi-instrumentalists" out there who'd dig one too. Finally, multi-instrumentalists could eliminate the hassles of lugging around more than one amp to their practice sessions, studio dates and gigs! ONE Practice Amp that handles everything. WHY hasn't someone thought of this before? to be the first reviewer to get my hands on one! What do YOU think? 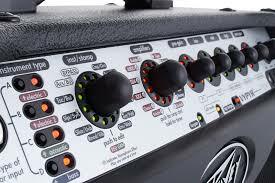 Would you buy a Peavey "ALL INSTRUMENT" Practice Amp if they introduced such a line? 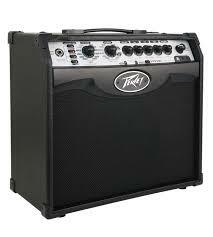 Peavey will consider producing an "ALL INSTRUMENT" line of Practice Amps. Let's hope so!